Cormac McCarthy has spent many years bent over this typewriter banging out books and screenplays, including All the Pretty Horses, No Country for Old Men, and The Road. Now, after many decades, he's giving up his trusty old gadget. He's not giving it up because he yearns for a newfangled bit of gear though. He's trading it for an identical model and only because it's not working as well as it should anymore. 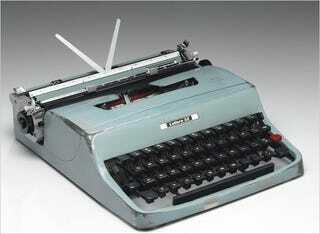 The original typewriter will be auctioned off by Christie's with all the proceeds going to a charity. It has never been serviced or cleaned other than blowing out the dust with a service station hose. ... I have typed on this typewriter every book I have written including three not published. Including all drafts and correspondence I would put this at about five million words over a period of 50 years.